Miami University has two parking garages and approximately 100 parking meters on campus which do not require a parking permit for use. Garage and meter fees must be paid for the time parked at either type facility. 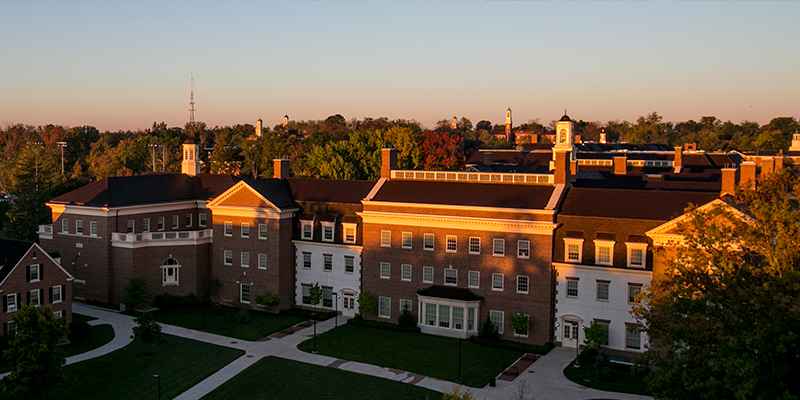 A parking permit is required to park on Miami University's campus and the streets which run through or adjoin campus at all times unless otherwise noted. The area in which a vehicle may park is determined by the color of its parking permit; it may also park in areas which are listed below its color in the list above. Permit required Monday-Friday 7:00 a.m. - 6:00 p.m.
801 S. Patterson Ave. Unmetered spaces - RED. Metered spaces - Parking meters must be paid (no permit required) Unmetered spaces - RED, BLUE, YELLOW, WHITE after 6 pm. Maple Street North Of Center Dr. Maple Street South Of Center Dr. Maple St. RED, BLUE No permit required 6 pm to 7 am and on weekends. Oak Street North Of Center Dr.
Oak Street South Of Center Dr.
701 E. Spring St. enter from Patterson Ave. Unmetered spaces - RED. Metered spaces - Parking meters must be paid (no permit required). Unmetered spaces - RED, BLUE, YELLOW, WHITE after 6 pm. Handicap parking spaces are located in each parking lot and parking facility. A valid state-issued disability placard is required IN ADDITION TO a Miami University parking permit in order to park in a handicap parking space on Miami University's campus. A vehicle displaying a valid state-issued disability placard in addition to any valid Miami University parking permit may park in any legal parking space on the Oxford campus, regardless of the permit restriction on the lot. The two parking garages on campus are open to the public daily. Be sure to visit our Parking Permits page for specific options and prices. Beginning July 1, 2017, students and employees who prepay for parking garage access will use their Miami University ID card for entry and exit at the facilities instead of the separate prox card issued by parking services. Please return old prox cards by dropping them in the box at the exit from the garages. The cost of South Garage access has been reduced by 50% for employees in 2017-18 to accommodate individuals who may have been displaced by the Admission Guest parking areas on Maple St. If you lose your entry ticket or experience other issues entering or exiting the parking facilities, press the intercom button on the entry or exit column to be connected to an operator who can assist. University departments and offices may purchase single-use garage vouchers to allow guests to exit either parking garage at no charge. See Garage Vouchers for more information and to place an order. All of Miami University's parking meters are "smart" meters which are solar-powered and cellular-enabled, allowing motorists to use credit and debit cards to pay for parking time as well as coins. Parking meters are enforced 7 days a week from 7 a.m. until 10 p.m. The cost for most meters is $2.00 per hour. Time limits at meters vary, please read the display on the meter for details. No parking permit is required at parking meters, but hourly rates must be paid. Vehicles with parking permits must pay hourly rates at meters. Visit MyParkingReceipt.com to access online receipts. The Shriver Center west lot (off Maple St.) and MacMillan Hall lot are reserved for Admission Guest Parking permits only Monday through Friday between 7 a.m. and 4 p.m. After 4 p.m. on weekdays and all day on weekends these parking lots are available for public parking by paying the kiosk in the lot and displaying the receipt ticket on the dashboard of the vehicle. No permit is required. The rate is $1.00 per hour and the kiosks accept coins and credit cards for payment. Did you know you can print your own receipt for meters and kiosks on campus? Visit MyParkingReceipt.com to access your online receipt!